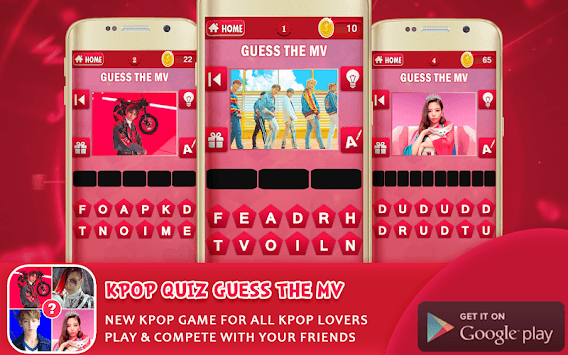 Kpop Quiz Guess The MV is a new game and the best way to test your knowledge about the best K-pop MVs of the most popular artists! Try this app to see how many K-pop Music Video you really recognize. This is one of the biggest kpop quizzes featuring over 100 kpop songs and always adding more! 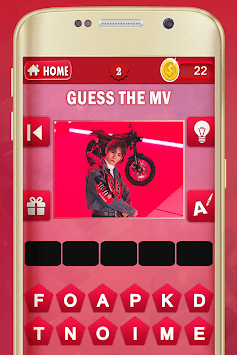 This Kpop quiz 2019 game is completely free to try. Just tap the download button and start playing. In this Kpop Quiz you can Guess the kpop song from a part of a MV, it's easy to play but hard to guess. Well, this is different from other quiz it start easy but It becomes more difficult with increasing the levels just real kpopers can finish this game. So How many song can you know? Can you master this K-pop Quiz? ★Main game: We give you unlimited time to answer each question so that you can play relaxed without any time disturb you but try not to google so much. ★Challenge game: We give you 1 minute to challenge yourself and see how many songs and mvs you can know in 1 minute. Kpop Quiz Guess The MV contains newest and legendary MVs of most popular K-pop idols. f(x), 2NE1, Girls Generation, Miss A, Sistar, Super Junior, EXO, Big Bang, Shinee, Infinite and BtoB, A Pink, Girl's Day, VIXX, Bangtan Boys (BTS), AOA, Twice, Exid, Red Velvet, Snsd, Blackpink and more new Korean groups. Download Kpop Quiz Guess The MV, share it with your friends and challenge them and try to finish the game. 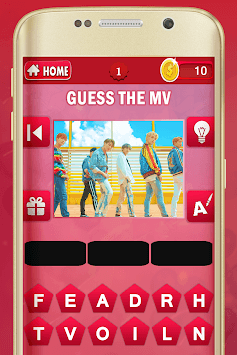 If you love k-pop music and you enjoy our game don't forget to rate the app by 5 stars and leave a comment this allows us to continue updating and adding new MVs.